As the founder and former international spokesperson of Montreal based civil rights advocacy group, The Canadian Hungarian Democratic Charter, I would like to publicly pay my respects to the late Senator John McCain, who passed away this weekend after a heroic and dignified battle with cancer. Senator McCain was a Conservative American politician, a prominent member of the Republican Party, who ran for the American Presidency on two separate occasions. His name, his courage, and his dedicated service to the cause of justice, and civil liberties is cherished by tens of millions not only in America, but all around the world. I would like to speak on behalf of those, who cherish his name in a small Central European country, called Hungary, and among those Hungarians, who have been forced to flee from their homeland by Hungary’s autocratic ruler, Viktor Orbán. John McCain’s calling of Viktor Orbán a „neo-fascist thug” on the floor of the American Senate once he returned from visiting Hungary (See here. ) made huge waves globally. It reflected the views held by tens of millions inside the Western Alliance, not to mention the hundreds of thousands inside Hungary, whose rights to justice, the rule of law and sustainable economic development have been hijacked by Vladimir Putin’s Hungarian disciple. Orbán publicly idolizes the Russian, Chinese and Turkish “model” of governance, where transparency, checks and balances on centralized power have been eliminated and replaced with rampant corruption and civil rights abuses, wrapped up in “fake news”. According to the last survey by Freedom House, (See here.) the Orbán government engineered the sharpest retreat from the principles of Democratic governance among members of the EU. In fact, he is the political trailblazer for all of Europe’s neo-fascist political leaders. Many of them, like Holland’s Geert Wilders, have a residence in Hungary, in order to be closer to their “Messiah.” Sweden’s Kent Ekeroth has just announced he is looking for an apartment in Budapest. Neo-fascist parties sing Orbán’s praises in neighboring Poland, Austria, Slovakia, and now Italy. Orbán is the template for alt-right, Christian white-supremacists in the United States, the UK, Germany, and Scandinavia. Orbán’s “visceral” language is identical to the one used by Donald Trump. They both undermine the public’s capacity to distinguish reality from illusion, facts from fiction. It’s a language that is designed to mobilize voters in a world in which people are increasingly at sea, rudderless and angry. It is the ability to manufacture messages that resonate with our emotions, the ability to combine these emotional messages with “fake news” – hearsay and innuendoes – and to transmit them through the internet, that is enabling a new breed of “political players”, to slip under the radar of rationality, and capture larger and larger shares of the public’s attention. It’s this uncanny “skill set”, exploited by Trump, by the Mullahs of Radical Islam, by the former KGB agent, Vladimir Putin and his Central European cohorts, like Hungary’s Viktor Orbán, along with the new crop of right wing neo-fascist “players” in Western Europe, that is taking humanity for a ride it shall never forget. It is against this gang of “neo-fascist thugs” that Senator McCain raised his voice, and we should never forget his courageous deed. “Since Prime Minister Viktor Orbán came to power in 2010, antidemocratic constitutional changes have been enacted, the independence of Hungary’s courts have been restricted, nongovernmental organizations raided and civil society prosecuted, the freedom of the press curtailed, and much more. These actions threaten the principles of institutional independence and checks and balances that are the hallmark of democratic governance and have left me deeply concerned about the erosion of democratic norms in Hungary. “The Organization for Security and Cooperation in Europe (OSCE) and the Committee to Protect Journalists have condemned Hungary’s media laws, saying that they create a climate of fear and media self-censorship, even after critical changes were made to account for previous complaints from the European Commission. ‘The changes to the Hungarian media law only add to the existing concerns over the curbing of critical or differing views in the country,’ said Dunja Mijatovic, OSCE’s representative on Freedom of the Media. “The European Central Bank has repeatedly warned that Prime Minister Orbán’s government is encroaching on the independence of its central bank, calling for him to respect the independence of monetary policymakers and condemning attempts by the government to threaten central bankers with dismissal if they oppose government policy. Thank you, and farewell Senator McCain. May your soul rest in peace. We shall overcome ! For us, it’s you, not the man in the White House, who is the Voice of America ! 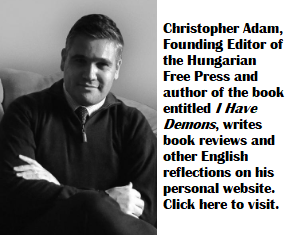 Author: András Göllner A dual Canadian-Hungarian citizen, András B. Göllner is one of the Founders, and International Spokesperson, of the Canadian Hungarian Democratic Charter. With a Ph.D in political economy from the London School of Economics and higher degrees in International Relations from Carleton University and Université de Montreal, András B. Göllner is a respected international scholar on Democratic Governance, Political Communications and on a broad range of business and society issues. He is an Emeritus Associate Professor at Montreal’s Concordia University and the author of a number of well known books and articles on business, politics and international affairs including Social Change and Corporate Strategy. Stamford:IAP, 1983; Public Affairs in Canada. Montreal: IRPP. 1984; and Canada Under Mulroney (ed. with D. Salee), Montreal: Véhicule Press, 1988. He is a frequent speaker at international conferences on both sides of the Atlantic. Following the collapse of communism in Hungary, Dr Göllner played an important role in the broadening of democratic processes in the country of his origin. He coordinated Hungary’s first communications strategy for EU accession, and worked as a strategic communications advisor for various democratically elected governments over the past twenty years in Hungary. He lives in Montreal. The author has praised a real hawk. He was the strongest supporter of Bush’s war efforts in Iraq and Afghanistan. America lost a decent and principled man. Did you hear his final address to the American people, read posthumously in Washington? Every word was a reminder of the civility that we stand to lose in our politics today. Rest in peace, Senator McCain. You will be remembered. Thank you for recognizing my ability to rise above the divide of petty partisan politics. I trust you will agree with me, that when a longtime representative of the people passes away, we should focus on his or her service to the community rather than on his or her weaknesses. If Senator McCain was a hawk, pray tell me what kind of a bird is Viktor Orbán, Vladimir Putin, or Donald Trump ? Orbán has sent Hungarian troops to the Middle East, and has just about doubled Hungary’s military expenditures on US weaponry to buy his way into the White House. What would you call Putin and Assad, whose troops have murdered hundreds of thousands of the Syrian Middle Class for wanting to enjoy the benefits of their civil rights ? And what kind of a bird is the Donald ? He talked about carpet bombing civilians in Iraq during his campaign. He has vastly increased the earnings of the American military industrial complex with his last budget. He has spent the summer bragging about his feat of sharply increasing the military expenditure of NATO allies not to mention that of the Saudis, who not only had a hand in the attack on the World Trade Center, but have, to all intents and purposes declared war on Canada a few weeks ago ? If McCain is a hawk, what kind of bird is the Donald ? Is he a duck or just a tweety bird ? Interesting how his death can bring the two of us to common grounds. Strange isn’t it? We have to be careful with how we choose our words. 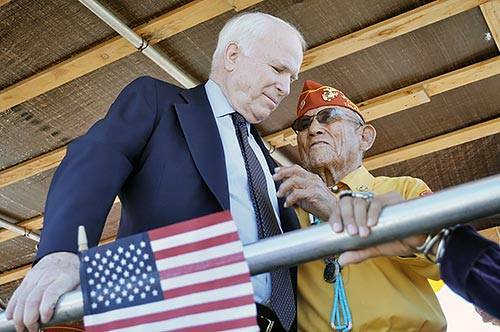 Senator McCain was acceptable by most of his constituents in Arizona in 6 consecutive Senatorial elections. We vcan’t take that away from him. A small majority of Americans did not bet on him in 2 Presidential contests, but McCain found both of his political conquerors, Bush, and Obama, acceptable. He had the stature, and the civility to call the man who defeated him at the polls, HIS President. I am not an American citizen, but if I were one, I would not have voted for Mr. McCain. But I accept him now, especially now, in the hour of his passage to his final resting place. He was a fellow human being, who was able to hit both the high notes and the low ones. In my books, focusing on his high notes at this time is more dignified than, focusing on his low ones. Senator John McCain is a man who fought for his Land, Orbán is a man who fight only for himself. Because of that Hungary have a low level on, education, health and culture and a high level of self-pity.